I would advise POC men and women to develop a strong personal brand via blogging (or vlogging), gain a valuable skill set such as programming, accounting, or digital marketing that keeps them employed, celebrate your small wins because they will create bigger wins in the future, and share your knowledge with people around you. I had the pleasure of interviewing Corey Harris, a technology enthusiast with a passion for distributed ledger technology-blockchain and crypto-currencies. He’s interested in using blockchain to solve issues around wealth disparities, climate change, and education. If he’s not working he is hiking, training for races, or eating butter pecan ice cream. When I was 11 years old, I sold mixed CDs during the Napster era. I would purchase blanks CDs, create playlists, burn CDs, negotiate prices with customers, and repeat the same process every week. I was able to open my first bank account from money saved from working part-time at restaurants and selling CDs. I realized years later, that I was learning about product marketing and placement, financial management, marginal costs, and supply chain management. When I attended, UNC-Chapel Hill, I met my first co-founder, Zaid Farooqui, and started my first company, Blinkness, an easy professor finder. Blinkness is now used by 90% of UNC college students. 10 years later, I am still working in technology as a digital marketer. I discovered Bitcoin in 2009, as a college student, and like most people thought it was a joke. As an Economics major, I learned how our financial system is controlled by the International Monetary Fund (IMF) and government-backed (or supported) banks-none to less. I assumed Bitcoin was child’s play. In 2015, I opened my first crypto wallet when Bitcoin hovered around $200. In 2017, I created Blackchain, a collaborative blockchain education platform, after seeing how tribalism created bias Blockchain education. Blackchain’s goal is to serve as a safe place where people can be constructively critical of various new emerging technologies. Below are three key lessons that have molded the way I live. I moved to San Francisco, three years ago, and no one with exception to two people wanted me to make the move from North Carolina. My close family and friends wanted what they perceived to be best for me, however, it didn’t include following my dreams. You must follow your dreams and if you fail that’s okay. Get up, reflect, and do it again. You can’t have growth without pain. That’s why they are called growing pains. When I used to make CDs for customers as a kid. I learned if I gave them exactly what they wanted they would be more likely to become a repeat customer. This meant following their instructions for music down to the teeth. This lesson has had a profound impact on my personal relationships as well as helping me to become a better at maintaining relationships with people I care about the most. When I was a kid, my Dad said to me: “Here Son. Here’s $10.” I looked at him and said “Can I get $15?” and then he gave me $5. In that moment, I learned to be thankful for what you have and not to take a person’s kindness for weakness. Blackchain, a collaborative blockchain education platform, is my baby! Every month, I host 2 monthly meetups in San Francisco sharing my research with crypto-enthusiasts to create a collaborative learning environment about blockchain. Our meetups average 10–15 attendees and a 31% attendance rate. In 2019, we will be launching a more aggressive marketing strategy and plan geared towards helping more people understand Blockchain and its potential impact on their daily lives. First and foremost, I could not have been able to make it this far without my parents. Dean Crisp, UNC-Chapel Hill’s Student Services Vice-Chancellor, approved my application and told me that he would be my mentor for my entire time at UNC-Chapel Hill. We would meet for lunch or dinner every other month and he would advise me on everything from fraternities, course selection, life, and career advice. Cryptocurrencies can be used to incentivize two separate stakeholders with opposing motives and bring these opposing parties together by creating a token with a shared extra benefit. For example, you could create the “H” coin, to be used by the homeless to pay rent, and land developers could use the “H” coin to finance commercial development projects to avoid lower transaction fees. In this example, Land developers and the homeless population have traditionally been opposed to each other, however, with cryptocurrencies, a shared benefit could be created using cryptocurrencies to solve this pressing social impact issue and support triple bottom line business models. Traditionally, wealth creation and distribution has only benefited the 1% of the world. With crypto-currencies and blockchain, macroeconomic decision-making, and wealth creation could be evenly distributed across the globe via smartphones (or wireless networks). Today, the industry has not held up to this promise, however, there is still an opportunity to create a token(s) that could be evenly used across the globe. This is my favorite use case for blockchain. This could potentially almost eliminate data breaches happening in the future. Facebook, Equifax, and Under Armor-to name a few, have all had their customer data stolen from them by hackers. These companies not only lose money from costs incurred from repairing the hacking flaw, but their brand also becomes weaker as people lose trust in them which in turn increases their customer acquisition costs. Currently, companies house their clients’ data in servers which makes them popular hacking targets. With Blockchain, a company could take cut their clients’ data into millions of encrypted data pieces and randomly distribute these data pieces across a distributed computer network. A computer network of 1000 computers is harder and more expensive to hack than four centralized servers. It is human nature to do things out of necessity. However, Another applications is to reinforce positive behaviors among society. For example, what if people were compensated with a token for eating healthy and exercising. Also, with Blockchain, companies can more easily move and share data to support their growing businesses. Classical, Neo-classical, or Keynesian economic schools of thought are not able to explain how the proliferation of crypto-assets occurred. Historic economic theories tend to view economic growth as a function of investments and expenditures of governments, and the wealthy. In 2017, most of the economic growth in crypto-currency came from the average person investing and then large enterprises came in which drove the market up to roughly $1 Thrillon market capitalization. As a Economics major, I see a huge opportunity in creating new economic schools of thought such as tokenomics to explain and create more sustainable incentive models for causing positive social change. What are 5 opportunities do you see for improving Blockchain technology? At the moment, blockchain could not be used to support companies such as Google and Facebook. Improving the transaction per second speeds will be immense in being able to support Enterprise-grade web applications. This is a problem being worked on many projects such as NEO, EOS, Ethereum, and Stellar. All top twenty cryptocurrencies’ market capitalization is held by their top 100 of token holders. This means that the wealth being generated from crypto-currencies are not being evenly distributed. A major tenant of blockchain is that it is suppose to democratize power to communities versus a small elite group. Anytime a young industry is all of a sudden hit with an infusion of cash, the scammers will appear. Buggy smart contracts are also a sticking point in regards to increasing the costs for Ethereum based applications. The industry lacks proper standards holding advisors, founders, teams, and investors accountable for creating better systems. I believe over time as people and local governments become more versed on Blockchain, regulating it will move towards making it more equitable for all. Enterprises have the resources to support the research and development efforts to continuously improve Blockchain technology. The key to gaining wider adoption for blockchain is to fix its infrastructure and companies such as Google, JP Morgan, Fidelity, and Goldman Sachs, are making efforts to make it applicable for solving their operational impediments. In 2017, we saw an explosion in new blockchain companies and crypto-currencies being created. Most of those tokens were only made to serve one purpose-a fundraising to for targeting investors. As we have seen 2018, the crypto market has gone bear and most new ICO companies have failed. Crypto companies must do a better job of thinking through how their token will be used and creating viable use cases for their token. I have been able to use my experience in technology, passion for bringing people together, and sharing to help educate more people about Blockchain technology. 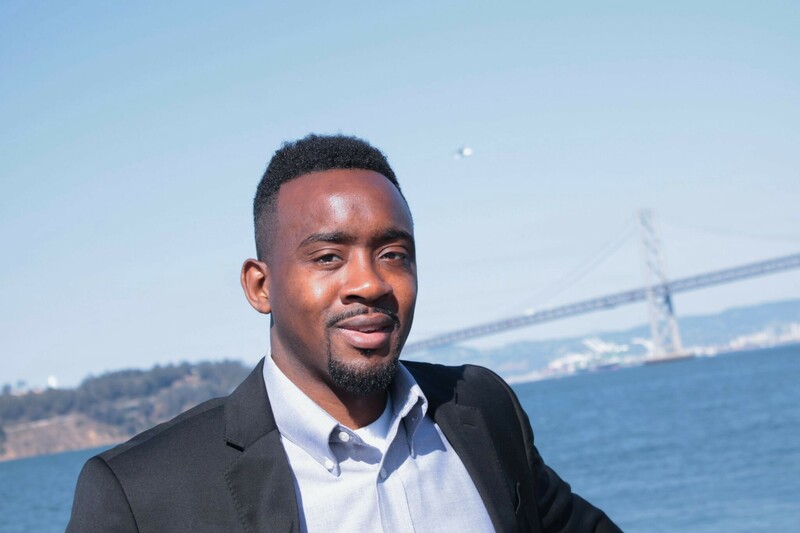 I blog and host monthly meetups to help people learn more about blockchain and an extra benefit is to show people in the Bay Area that there are African-American males are active in the industry. I view it as my personal duty to share and collaborate with others. Cultural understanding and unbiased education. There’s a huge argument about what diversity truly means. Diversity means having a variety of people in the house. Inclusive is inviting that variety of people to eat at your dinner table. I can’t take credit for that quote! People of Color like anyone else must be a master of your craft and put themself out there. I believe that as people learn more they will inevitably want and do more. By making it more accessible to POC men and women they will naturally increase their participation in the industry. My glass is half full not half empty. When I first moved to San Francisco it was very hard. I worked at Yelp and was homesick. Often times, I would fall into a negative mood and think about how “bad” I had it. I can’t recall where I heard the quote from but did after hearing it, a switch went off in my head one day and said: My cup is always half full! Even though living in San Francisco was uncomfortable during my first year, be able to live my dream was more than worth it. End senseless killings of unarmed African Americans. This is an issue that personally impacts me and even though evidence has been presented that police are unconsciously biased against African Americans and treat our communities and individuals as criminalized war zones to be punished versus uplifted. You can follow me on my blog, Twitter, or Hacker Noon for my posts regarding Tokenomics.